Fire appliances, alarm systems, electrical wiring, junction circuits, traffic devices, safety nets and warning lights, among other things, should be regularly checked and maintained. If a shortcoming that could entail serious danger for safety and health is discovered during the checks, work should immediately be stopped. Anchoring during temporary erections. Think about the effects of wind. 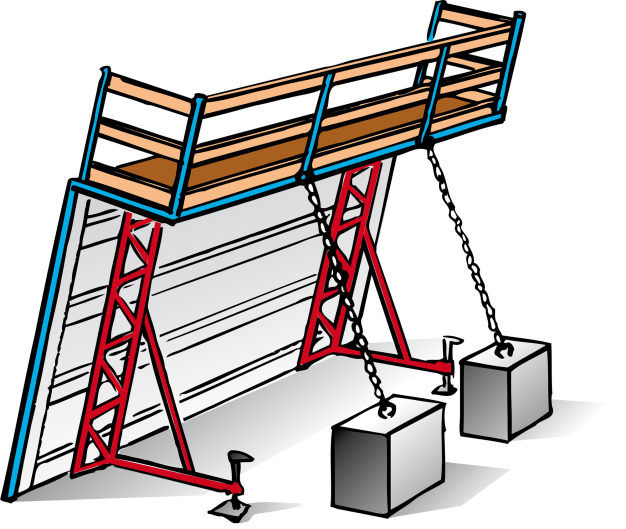 Serious accidents can occur if stored or stacked building material starts to move. If there are such risks, the building products should be stabilised. Measures can also be necessary during work with building products or equipment that contains stored energy. This can, for example, apply to reinforced concrete and spring-loaded doors. Consider that anchoring of building material etcetera must be able to cope with high winds. Structural support for safe erection of, for example, concrete elements so that collapse and slippage is prevented. During outdoor work, the employees should be protected against weather and wind etcetera, which can have a negative impact on their health and safety. This can mean hard gusts of wind, extreme heat or cold, heavy or cold rain, or heavy snowfall. 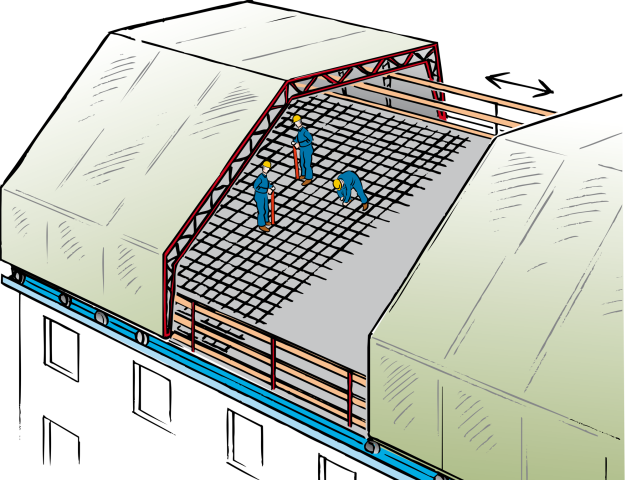 A good protection measure is sheeting of the workplace with climate protection. It is important that this protection is satisfactorily dimensioned and anchored against the snow and wind loads to which it can be subjected. 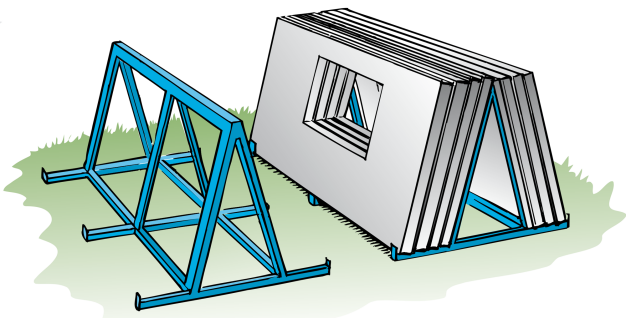 Climate protection is often placed over a facade scaffold, and must thus be dimensioned with respect to the extra loads that the weather protection transfers to the scaffold. Long term or intensive exposure to sunlight can also be dangerous. Think also about the risk of lightning. Areas where there is a risk of falling objects should be cordoned off and marked in some way. If such area must be entered, overhead cover, covered walkways, or the equivalent should be arranged. Earthmoving work should be planned and carried out so that the stability in the ground is sufficient with reference to the loads to which it can be subjected. There should be checks carried out as to whether there are cables or dangerous substances in the ground. 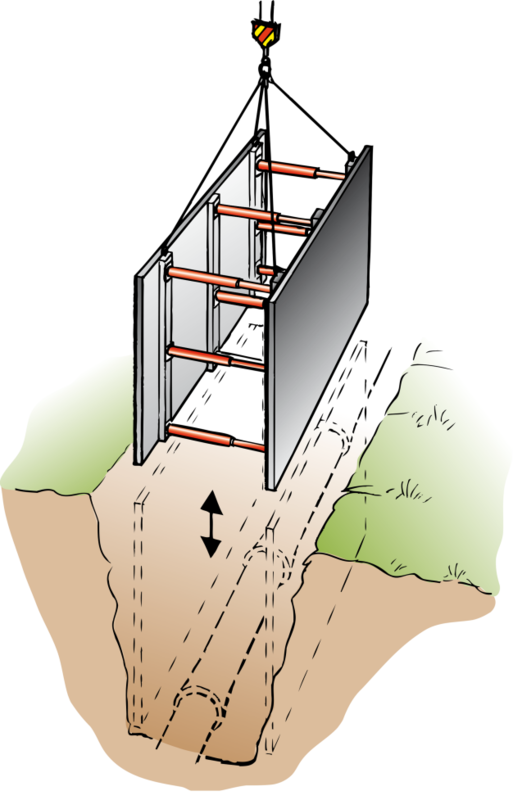 Structural support, for example, sheet piling, should be used if the risk of dangerous collapse is not assessed as absent. Alternatively, the excavation may be carried out on a gradient. In both cases, the safety against collapse should be more satisfactory. Vehicular traffic should be kept at a distance from the excavation pit. Preventive measures should be taken so that, for example, excavation machines do not fall down into the hole. In a special section of the provisions about building and civil engineering work (AFS 1999:3Eng), risks from ’external’ vehicular traffic (cars, trains and so on) are dealt with. This applies to traffic that, without having any connection with the building and civil engineering work, passes by or through the place or area where the work is being carried out. Such risks can exist with roadwork or the building of tracks, but also, for example, during the construction of buildings near a street. In the provision, a number of measures is stated, and these should be considered or taken in order to prevent risks. A number of them should be considered in a certain order. As a primary option, the traffic should be rerouted so that work is not affected. High visibility clothing with reflection should be worn, among other things, by those who direct traffic, and by those who work in places that are not separate from traffic. The provisions are aimed towards all who have responsibility for building and civil engineering work, including developers. They contain, among other things, regulations about the transport of material at construction sites, roof work, roadwork and safety nets.